(From Sony lens literature) Sony Electronics, a worldwide leader in digital imaging and the world's largest image sensor manufacturer, has introduced the latest addition to their expanding full-frame E-mount lens lineup, the FE 24-105mm F4 G OSS Standard Zoom (model SEL24105G). The new full-frame lens covers the commonly used 24 to 105mm focal length range, delivering outstanding G Lens™ imaging performance with the most lightweight design in its class1, maximizing its versatility and usability. 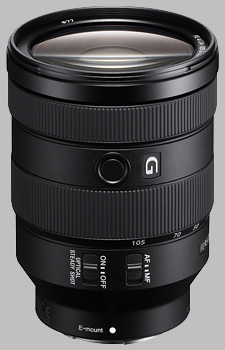 Therefore, the FE 24-105mm F4 G OSS can be used for versatile shooting such as landscape, portrait, wedding and so on. This lens also features fast, precise and quiet autofocus capabilities in both still and video shooting, making it an ideal complement for Sony's extensive lineup of E-mount cameras. Sony's new FE 24-105mm F4 G OSS lens delivers excellent corner-to-corner sharpness throughout the entirety of its zoom range, while also producing beautifully rendered 'bokeh' or background defocus at all focal lengths. The lens also has Sony's original Nano AR coating to minimize flare and ghosting, and utilizes a circular aperture to ensure it delivers high quality bokeh that is consistent for all Sony's G series. The new FE 24-105mm F4 G OSS lens weighs in at approximately 663 grams (23.4 oz), making it the lightest lens in its class1. When combined with one of Sony's compact E-mount bodies, it gives photographers and videographers a far more mobile, manageable camera system that greatly increases their shooting flexibility. In order to keep up with fast-moving subjects, the new standard zoom lens features a DDSSM (Direct Drive SSM) system that is capable of rapid positioning of the lens' focus groups with high accuracy and very minimal noise. This advanced system combined with a constant F4 aperture at all focal lengths makes the SEL24105G an excellent choice for both still and video shooting. The Sony FE 24-105mm f/4 G OSS SEL24105G doesn't have any user reviews yet!